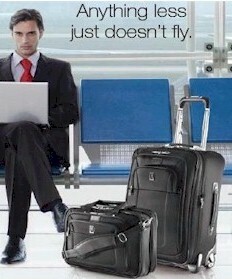 Turn to Travelpro Luggage for a wide selection of popular luggage. The inventor of rolling upright suiters and more. They provide the most current products and the most latest advancements with favorable pricing. Half-a-million flight crew members world wide have chosen Travelpro. Designed for the frequent traveler, the ultra-premium quality Platinum� 7 Collection from Travelpro� takes you to the next level of luxury travel. From the chrome accents to the oversized skate-style wheels and sleek, molded corners, this stylish collection is also packed with practical features that make travel easier. Available in black or plum. The Crew 8 series. Durable Micro-Ballistic exterior with Teflon coating for water repelling. H2O guard water resistant lining. There's a Travelpro exclusive honeycomb frame that's lightweight yet indestructible. Available in Black or Spruce. With Walkabout� Lite4, Travelpro gives you lightweight Spinners built to suit any budget. Practicality, style and value all rolled into one. Available in black or blue. The WalkAbout Lite series introduces an economical Lightweight line from Travelpro. In Black or Forest Green. This collection is lighter than ever, plus it's more durable; with new lightweight frames and top-quality 2520 Denier ballistic nylon. Comes in Copper and Black. The Premier Travelpro series! Lighter more featured pockets. With top of the line DuPont 1050D Military Ballistic Nylon. The WalkAbout Lite 2 series improves an economical Lightweight line from Travelpro. From 7.5 lbs. Updated handles, sculptured high-tech appeal. Lighter weight and carries strength and wear ability of Ballistic nylon. No compromise with great looks. In three colors.